One of the most-asked questions I get about Devin and my engagement is, "How did you decide on such a unique ring?" 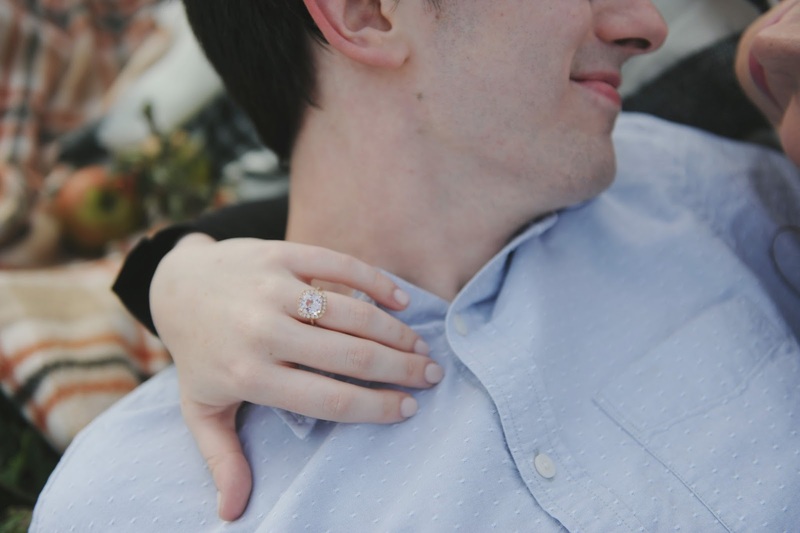 So, I thought I would write a post about how we decided on a "non-tradition" engagement ring and how you can find your perfect ring! Devin and I had been together for five years before he asked me to marry him, so obviously we had been talking about getting engaged for awhile. We had gone to a few jewelry stores and I tried on diamond rings, but they weren't giving me that excited feeling inside. I've always been one to do things differently than others, and if I'm going to wear one ring for the rest of my life I want it to be unique to me - something no one I know has. That's when we decided to look into colored precious gemstone engagement rings. A college friend of mine put me in touch with her mom who designs jewelry out of Cleveland, OH. We knew that if we wanted a unique engagement ring, we'd have to work with a jewelry designer directly to come up with something truly custom. 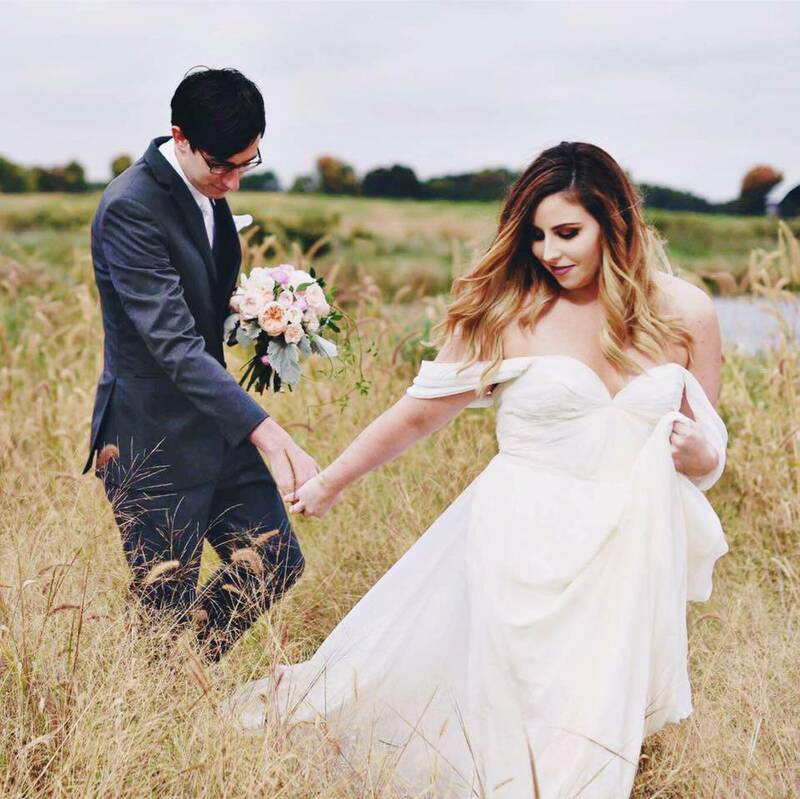 I emailed her different photos of sapphire and morganite rings set in rose gold I had seen online, and once she got an idea of my style, she and Devin secretly emailed while the ring was in production. A few months later, Devin proposed on a Chicago rooftop with a 5 carat pink sapphire with a diamond halo set in 18k rose gold. Every couple's engagement ring journey is different. I know some girls that want to be complete surprised with their engagement rings, and other girls like me who don't mind going shopping with their boyfriends for a ring. If you're like me and want to be involved in finding your engagement ring, here are a few pieces of advice I've learned through our process! Make sure you get some diamond or precious stone education before you take the plunge. Learn about the different color, clarity and sizing measurements that can make a stone more or less valuable. Many stores will give you a "Diamond 101" speech when you tell them you're looking for an engagement ring. When Devin and I went into Tiffany's, the sales associate took the time to explain what makes a good diamond a good diamond. She even provided us with a little book that explained everything she went over with us. This came in handy while we were shopping elsewhere! The thought of being engaged can be extremely exciting, but you don't want to rush into the first ring you see and fall in love with - which is easy to do when you're searching online. In my opinion, it's way better to go into an actual jewelry store to see the stone IN PERSON. If you buy something online, you're buying sight unseen and you don't know what you'll end up with. Yes, you can end up with a beautiful ring purchased from the internet, but if you really want to know everything about your ring, go to a jeweler. Sometimes bigger is better, but when it comes to engagement rings (in my opinion), it's better to focus on the quality and clarity over the carat weight. You want to find a ring that will last you a lifetime, and if you sacrifice the quality of your ring to have something bigger, it may not last you as long. Especially if want something to pass down through generations to come, you'll want to invest in the best quality stone possible. If you have any other questions about unique engagement rings or ring shopping in general, feel free to commend below or email me! I'd be happy to answer any questions you may have!